On an oppressively hot Monday in August of 1966, a student and former marine named Charles Whitman hauled a footlocker of guns to the top of the University of Texas tower and began firing on pedestrians below. Before it was over, sixteen people were dead and thirty-two wounded. It was the first mass shooting of civilians on a campus in American history. Monday, Monday follows three students caught up in the massacre: Shelly, who leaves her math class and walks directly into the path of the bullets; and two cousins, Wyatt and Jack, who heroically rush from their classrooms to help the victims. On this searing day, a relationship begins that will eventually entangle these three young people in a forbidden love affair, an illicit pregnancy, and a vow of secrecy that will span forty years. Reunited decades after the tragedy, they will be forced to confront the event that changed their lives and that has silently and persistently ruled the lives of their children. 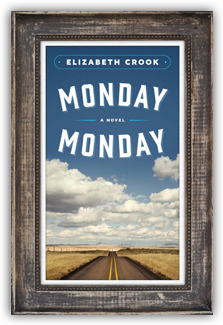 With electrifying storytelling and the powerful sense of destiny found in Ann Patchett’s Bel Canto, and with the epic sweep of Jess Walter’s Beautiful Ruins, Elizabeth Crook’s Monday, Monday explores the ways in which we sustain ourselves and each other when the unthinkable happens. At its core, it is the story of a woman determined to make peace with herself, with the people she loves, and with a history that will not let her go. A humane treatment of a national tragedy, it marks a generous and thrilling new direction for a gifted American writer. 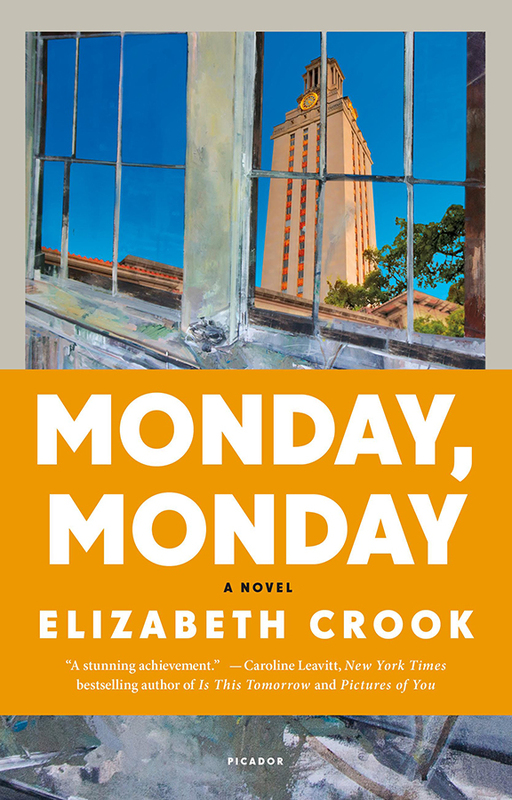 "The Austin campus is... the locale for the precise and harrowing beginning of Elizabeth Crook’s “Monday Monday.” An ordinary coed named Shelly Maddox has just left class on an August day in 1966 and is deciding whether to have a Coke or a Sego diet drink when Charles Whitman targets her from the top of the UT tower. The rest of the novel tracks the next 40 years of Shelly’s life, matching the action of that unforgettable opening chapter with equally compelling scenes of emotional turmoil and insight." "How could he put into words what it was like to hold someone who was bleeding to death?" wonders a character in Crook's intensely imagined novel…The story unfurls simply and smoothly, with a quiet insistence much like the path the characters will take. Crook renders Shelly's life delicately and fully, and artfully conveys her many moments of panic and anguish." "Framing a story in the context of calamity—in this instance, mass murder—invites both sensationalism and sentimentality; there have been few memorable successes, Jonathan Safran Foer’s Extremely Loud and Incredibly Close and Wally Lamb’s The Hour I First Believed among them. Add Crook’s latest to the plus side of the list….confident and lyrical as it smartly engages terror and its aftermath." "....a vivid portrayal of resolve in the face of great tragedy." "Love, loss, redemption, forgiveness—all are expertly drawn in a narrative that is so very authentic and generous. Crook skillfully weaves together several compelling stories through her close attention to the Texas setting. VERDICT The sensitively explored themes of adoption and coping with violence should create interest in this rich and satisfying tale." "Crook puts a microscope up to the most intimate moments, then pulls back to give beautiful and heartbreaking broad strokes to the lives of all three main characters and the families. [She] examines big questions: What makes a hero? What makes a family? How do you make peace with a traumatic past? Each character has their own journey to search for answers to those questions, and Crook leaves room for readers to wrestle with the questions as well. The story is heartbreaking at moments, but Crook does weave in some comic relief by the end to offset the emotional intensity." 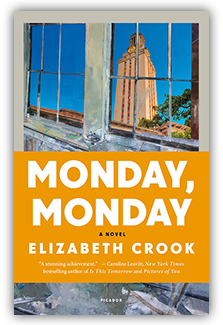 "In Monday, Monday, Elizabeth Crook uses vivid, gripping prose and in-depth historical research to shed light on one of the darkest moments in Texas history—that sadly still has relevance today—by detailing the fictional lives of three survivors caught in the crosshairs….The feeling of longing—to delve deeper, to answer unanswerable questions and to know what might have been had their lives not been forever altered—is a constant presence throughout the book…"
"Acclaimed historical novelist Elizabeth Crook — who’s written novels about Sam Houston and early Texas — takes three fictional people who were there that hot day in Austin and creates a picture of the era and relationships that will enthrall even the most jaded observer of the 1960s…"
"My journey through the pages of MONDAY, MONDAY was not what I expected. But it was a journey I’m glad to have taken. It’s a vivid reminder of how one brief moment in time can impact lives for decades and generations, making Elizabeth Crook’s latest a brilliant, beautiful and vividly told novel." 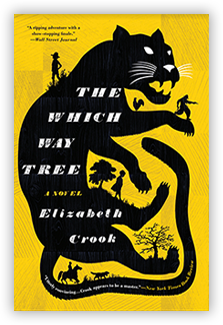 "An ambitious tale that explores the bond among survivors and the ways that seminal events in our lives continue to shape us long after they’re over… Crook's exploration of Whitman's massacre and its lingering effects will have relevance for years to come." "The tale unwinds like an examination of the ripple effect… As readers, we have the benefit of sitting in the sand and watching them break on the shoreline….This story is the antithesis to the diagram published in the pages of Time magazine shortly after the shooting. Crook forsakes the aerial view and brings your cheek right on down to the scalding pavement." "…[E]loquent...“Monday Monday” opens with a random, hideous act, but thankfully the novel isn't about that moment or the gunman. The shooting sets in motion an entire lifetime of relationships; from an act of violence springs love, friendship, loss, forgiveness and survival. Crook's writing shimmers with life... [The story] explores the complex messiness of being human and the ways in which even the best intentions can create consequences both hurtful and beautiful. It's intense and emotional, but never maudlin….The scenery looms large, but this is story painted on a canvas much larger than the state. Crook has created a gorgeous, worthy and entirely believable read." "Beautifully written...The book is a complex tale about overcoming fear and the risks and power of love...And it is the story of the compromises we all make to get by in this imperfect world. Part of what makes this book so compelling is the open and tender way each character is honestly but lovingly portrayed. ...A wonderful book that will make you cry, but also uplift you." "Monday, Monday explores the lives of characters who act—or don’t—in the face of tragedy, and it implicitly asks readers to ponder how their own lives might have been different if they’d just left home for work a few seconds earlier, or later; if they’d stopped for coffee on the way; if they’d said yes to that date, or no to that other one; if they’d picked up the phone, or answered that email. How much of our lives are choice, and how much chance? With Monday, Monday, Crook taps into the truth that the answer is some of both. "...a multi-generational story about what it means to go on after tragedy, and about the ways in which tragedy can bind people together, for better or worse. The novel is rich in detail and grand in scope, and examines an often forgotten chapter in American history: the first-ever campus mass shooting. It’s sure to satisfy historical fiction buffs everywhere, and provide a unique perspective on an event that, sadly, is no longer unique...Monday, Monday is a look at a tragedy that is rarely mentioned anymore, but in today’s world full of mass shootings, it remains more relevant than ever, showing how chance can alter a person’s destiny forever, and how tragedy can reverberate not just through one life, but through generations." "Crook paints strong and appealing characters just as vividly as she describes the Texas landscapes that they travel through. Monday, Monday is immediately gripping and wholly compelling — and it’s fiction at its finest. Crook takes a real event and zooms in, creating an imaginative space to explore the hard questions tragedies like the UT tower shootings beg: what are the less obvious wounds a tragedy inflicts on those involved? How does it alter the course of their lives? How do we move forward in the face of tragedy, or are we forever bound by it?" "Far more people remember the Mamas and Papas than Charles Whitman. But this was a singular event in the troubled ’60s, described by some as America’s first modern-day, peacetime, mass shooting on public soil. The University of Texas shootings, of course, came long before CNN and the Internet. If a tragedy of that magnitude occurred today, we’d be subjected to thousands of interviews and essays and psychological profiles about the victims and what they went through. But all that coverage of the Boston Marathon bombings, even the most artful and inspiring stories about the Boston Strong victims, provide no more insights than this book does about the inner thoughts and bonds created when madmen reach out to destroy others. So this book, recast as a novel about a mass murder 48 years ago this summer, may help explain the mindsets of surviving victims from Columbine, Virginia Tech, Sandy Hook and the like." "Crook gets at what makes people act–and what makes them stall, and the ramifications of choice versus chance. Love, infidelity, heartbreak and unabashed joy trickle down through four generations...The emotional insights are like fireworks, and the story feels lived rather than written. Go read it." MONDAY, MONDAY, the latest novel by Austin’s Elizabeth Crook and winner of the Texas Institute of Letters’s Jesse H. Jones fiction award for 2014, is only nominally about Charles Whitman’s sniper attack from the tower on the University of Texas Austin campus in 1966; it could’ve been any horrific act of violence. This novel is actually about the butterfly effect (in the shape of a bullet), the long-term effects of violence on survivors, bonds forged during the aftermath, balancing conflicting responsibilities, atonement, and redemption…. The juxtaposition between the innocence of the young students – daydreaming in math class, taking lecture notes in history class – and the monstrosity of what is happening outside their classrooms (told from multiple perspectives) is remarkably powerful…. Crook peoples her story with likeable characters, ordinary people caught up in extraordinary circumstances. She is equally at home with stunning action sequences and the small comedic despairs that make up daily life.